Do you ever feel like your house just explodes? I've been cleaning this morning, and I cannot-for-the-life-of-me figure out where all this stuff comes from. I am a pretty neat person. I keep our home relatively clean and orderly, but I am overwhelmed by all the dust, dirt, debris, toys, paper, and laundry that has accumulated over the last few days. Man! Please tell me your house explodes too! And does anyone want to fill me in on LOST last night? I fell asleep mid-way thru and all I remember is John waking me up shortly after 9pm and telling me I'd probably be more comfortable in bed. I'm more confused about LOST now than ever! Sometime last year, my bloggy friend, Trish sent me an email telling me she was planning a visit to Colorado. Trish lives in Arkansas (my home state) but has family in Colorado. Trish has also become bloggy friends with my real life friends Holly and Joanne, and invited us all to spend a day of her Colorado vacation with her. Well, yesterday was "the day" and it was so much fun! We met Trish at her hotel, then went for coffee and lunch. We laughed and talked like old friends, and the day passed MUCH too quickly! If you had told me five years ago that I would make new friends via the world-wide-web, I probably would have laughed and quickly dismissed the idea. However, the internet is a truly remarkable tool for bringing people together. Through the world-o-blog, I've met some of the most amazing people who have been added to my circle of friends! I love it! And Trish, I'm so glad I can now add you to the list of friends I know beyond the blog world! Trish was so sweet to make each of us AND each of our daughters these beautiful, twirly scarves. Aren't they FUN? And wasn't that sweet of her? Trish, my girls LOVE them. In fact, Abbey got up this morning and put hers on first thing! Trish, and Holly, and Joanne have each blessed and encouraged me in unique ways. Friends, it was a JOY to spend the day with you. I get so cracked up at all the email comments I get when I don't post for a few days. Thanks for the concern, friends. I'm alive, but just trying to get my family well. This is the 10th straight day that one of my kids has had fever. Ten long days of playing nurse and giving ibuprofen and cough syrup and popsicles and Sprite...and you get the picture. Abbey is much better and has been back at school this week, but her big sister is feeling poorly and will likely be home with me again tomorrow. John worked from home today so that I could get out of the house and do my normal Tuesday stuff. I was extremely thankful. Other than that, there hasn't been too much going on around here. Will got a new game for the Wii. It's Wii Play and it's pretty fun. I spent most of this afternoon perfecting my laser hockey and table tennis, and I'm quite certain I can beat him now. He's definitely up for the challenge, but he doesn't like to lose. At all. Should be a fun after-dinner event. I introduced Sarah to Jane Austen a month or so ago when I let her watch Sense and Sensibility with me. She lost interest early on, but yesterday while home with me I talked her into watching Pride and Predjudice. I hadn't seen the new version and it arrived from Blockbuster.com, so we curled up in my chair and watched it together. I liked it, but not as much as the BBC version, and Sarah thought it was "okay". She did ask me to pause it mid-way thru and in her best British voice said, "Mother, I don't get it." And once I explained what was going on she stuck with me to the end. She DID NOT like Mrs. Bennett...said she talked too much and was way too silly. I couldn't agree more. We watched the Academy Awards on Sunday night. I don't think I've ever felt so disconnected. I hadn't seen one single film that was nominated for Best Picture. Not one. So sad. I didn't even have a favorite to cheer for. I DID know (and love) all the songs from Enchanted that were nominated, and I love the song from Once that won. In fact, I spent yesterday downloading them all from iTunes. Believe it or not, that was a first for me. My first iTunes download. Okay...I think I must end this post. I can't think of anything else even remotely interesting to mention here. And I'm quite sure you don't want to know about what we're having for dinner, or what the weather is like here, or my exciting grocery shopping trip last week. Believe me, the excitement would overwhelm you! Abbey is staying home with me again today. She's feeling much better, but still running a low-grade temp, and really, what's one more day when you've missed the entire week of school? The difference between my life this week and my life last week is stark. Last week my calendar was full, and I was barely home. This week my calendar is (gloriously) empty, and I've barely left the house. In fact, I can count on 3 fingers how many times I've been out this week--once for our date, once for a hike, and once to take Abbey to the doctor. Three times in a week. Can you say cabin fever? So...I'm taking my patient with me today and we're going to the post office to mail some stuff. After that we're going to Blockbuster to exchange our dvd mailers for free movie rentals. And then we're heading to the grocery store. And tonight, I'm going to Bunco all by myself. I don't know that I've ever been so excited about Bunco. Or the post office. Or the grocery store. Write that down somewhere. I believe I just mentioned enthusiasm for a grocery shopping trip. The girl is feeling much better today. She's still running fever, but is acting much more like herself. I knew my day would consist of playing nurse, so I kept my to-do list manageable. Or so I thought. So far I've only managed to do one thing...and I had lots of help. Those cute flowers are for a Daisy project we're doing next time we meet. It's going to be super cute. I did manage to get some pictures sorted for the yearbook project I'm working on--in between getting popsicles and juice and crackers and paper and markers and changing dvds and putting clothes on polly and reading books to the patient. At this rate, it doesn't look like I'm going to get my menu plan figured out until after bedtime. For lunch, Abbey insisted on getting out her porcelain tea set and serving me goldfish and water. It was lovely. Mid-way thru "tea" she said, "Mom, I have a great idea. Why don't you be my maid?" Ummm, news flash! I've been your maid for as long as I can remember, sweetie. Yep, she's feeling better. Not 100%, but close! She'll be home with me again tomorrow because she's still running a temperature, but I'm certainly not going to plan on getting much done. I'm having WAY too much fun playing with the girl! Oh...she was SO happy we picked up her Valentines yesterday. She made the adorable box that they're in. Cute, huh? And her sweet little Daisy friends delivered a card yesterday afternoon full of get-well wishes. Needless to say, she feels loved. There are two things that cause my calendar to clear instantly. The first is a snow day, the second is a sick child. I'll let you guess which one has me at home today. Don't get me wrong, I LOVE being at home. I just feel sad and helpless when one of my kids is sick. Abbey started running a temp on Sunday. It continued yesterday, and she woke up with 102 again today. She has a nasty cough too. I'm not one to run my kids to the doctor for every little thing, but I took her this morning because running a high fever for 3 days concerned me. She tested positive for Influenza B. Honestly, I can't remember my kids ever having the flu. This nasty virus has knocked my sweet little girl completely out. She'll perk up a bit when the Motrin kicks in, but as soon as her fever spikes again, she's back on the couch or in my lap. She doesn't like feeling yucky, but she's more upset about missing a playdate yesterday, missing her make-up Valentine party this morning, another play-date this afternoon, and she's beside herself about having to miss our Daisy bowling trip this afternoon. She's been looking forward to that for the last 3 weeks. So sad. I'm keeping her happy right now with popsicles, her Dora castle, a Madeline movie, and her pals Nicki and Chocolate. She's still running fever so she'll be home with me again tomorrow. I'm praying that the rest of us stay well. We're doing lots and lots of hand washing, and taking lots of extra vitamin C! I must go tend to my patient. Apparently she needs some applesauce. That's actually a good sign...she's hasn't had much of an appetite. On Saturday night, John and I had the opportunity to get away for some much needed time together. It was our belated Valentine date. We'd both had a busy and disappointing week and the chance to get away for a date was incredibly timely. 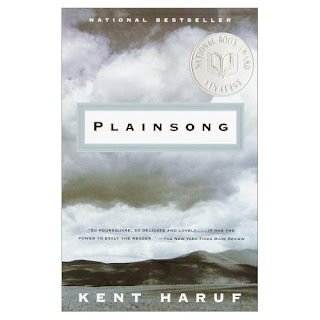 Two or three years ago, John happened upon a book called Plainsong by Kent Haruf. He read it on a vacation trip to Estes Park, and loved it. He encouraged me to read it as well...and about this time last year I did. It is not a cheery story, and each of the characters is flawed, but I found it to be a beautiful story of love and loss with redemption found in some unlikely places. So last fall, when we started seeing advertisements in the Denver Post for the stage production, we knew we wanted to try to go. Our tickets were a surprise gift from a friend of ours who who knew John loved the book and wanted to bless us. We drove to Denver on Saturday night, navigated our way to the Stage Theatre, and were captivated for three hours by the beauty of the story that played out before us. We laughed and cried and stood clapping at the end. It was stunning! It was such different evening for us. Usually a date for us consists of dinner and a movie or a trip to to our favorite downtown bookstore. It was great to break out of the mold and do something different and cultural and stimulating and sentimental to both of us. It was a beautiful night and after the heaviness of last week, it was a beautiful gift! **Mr. DP, thank you so much for your kind offering...it was very generous, and much appreciated. Do any of you ever feel disappointment? Perhaps you've been disappointed by your spouse, your children, other family members, or even a friend? Maybe you're disappointed with your marriage, or with your church? Or what about your circumstances? And dare I say disappointment with God? Yeah, I'm there too. And just this week, I watched my husband suffer through a big disappointment. Something he was really hoping for didn't turn out exactly the way he'd hoped it would. It was heart-breaking. And it made me wonder...what do we do with our disappointment? Yes, I know, we should take it to God. But I'm not really looking for the sunday school answer here. I've been around far too many people lately who smile and quote scripture and tell me that God is in control while they're dying on the inside. That exterior holds up...for a little while...but glimpses of the pain inside eventually makes its way out. Sometimes it peeks thru in the form of doubt, sometimes bitternesss, and oftentimes anger. I think there really has to be some kind of balance with all of this. Being able to acknowledge the disappointment without lessening it's effect on you, and at the same time being able to remain "present" in the situation. All of which can only happen because we have the Spirit of the Living God working in and through us. Thanks for allowing me to "think out loud" this morning. I know that writing a post like this will probably unleash fear and worry that things are not okay with us. They're fine. Really. Disappointment is a part of life. And some weeks just seem to hold more of it than others. I survived my crazy-busy week! Thankfully it's officially over for me, and my weekend begins tonight! It's a four-day weekend too because our kids are out of school tomorrow and Monday! I am telling you, I think need 4 days to recover from all of the busy-ness of this week. Well, we did NOT get that snow day everyone was oh-so-sure about yesterday. Apparently the storm shifted west and instead of 4-8 inches, we got maybe 1 or 2 inches. We did have a two-hour delay this morning, which was wonderful because it afforded me the time to make these boxes for the kids' teachers! I guess I sorta bought into everyone's excitment that today would be a snow day and I just kept procrastinating. Believe me, I was working fast and furiously this morning to get them finished, but didn't they turn out cute?? We filled them with Dove chocolates because I understand they're pretty tasty! *These boxes are super-simple to make, and if you want the instructions, click here. I've been running since I dropped the kids off at school this morning, so when John called and asked if he could take us out for dinner tonight, I just said "yes, I'd love that, and thanks for being sensitive to my complete exhaustion". He should be home in a little while and we're going to head to our favorite mexican place. I hope to come home afterwards (pleasantly full) and put on my warm, comfy pjs, and watch LOST with my favorite Valentine. I also plan on staying home all day tomorrow. I may even stay in my pajamas all day too. A storm is supposed to blow in tonight and dump 4-8 inches of snow on us and drop our temps about 30 degrees. I was up at the kids' school this morning and everyone is talking "snow day" tomorrow. Teachers were even making contingency plans for their Valentine parties should they be cancelled due to the weather. I don't get too optimistic about snow days anymore. Probably because we've had 2 as opposed to the ten we had used by this same time last year. But I'm wondering if today's lovely weather is the calm before the storm? We'll see. We're having a friend for dinner tonight. 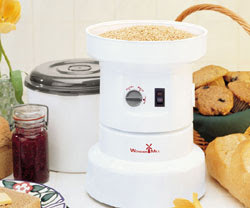 I have Joanne's Minestrone simmering on the stove, bread in the bread machine, and the salad ready to toss. I need to sweep the kitchen and make sure the bathroom is clean and get the table set. Definitely more calm around here than it normally is before company comes. Is this the calm before the storm too? I MUST have all of this stuff every morning. Stash brand chai--the absolute best, and I know this because I've tried them all. Turbinado sugar, sugar in the raw, whatever you want to call it, it adds amazing flavor. I don't like white sugar anymore. I've had the same bag of white sugar since September, but I buy a 3lb bag of turbinado every few weeks! My Arkansas mug. It was a gift from my dad a couple of years ago and I love it. It's the perfect size. Half 'n half. And not the low-fat kind either. YUM-O! I hear it calling my name right now! Well, wii survived the birthday wii-kend. You know, at our house, birthdays last more than just one day. Celebrations usually get stretched out for a few days, or in some cases an entire week. Will was sad for the fun to come to an end because of school today. It's okay though. We only have a four-day school week, so hopefully it will pass quickly. For all of us. My week is terribly busy. I am generally pretty good about not overloading my schedule, but several major things happened to fall this week, and it couldn't be avoided. The blog may be a bit quiet because I'm just trying to stay on top of all that I have going on the next few days. I'm living for the weekend! John and I have a Valentine's date planned too, and I can't wait to tell you more about what we're going to do. So very excited about that. It's snowing again this afternoon. I hiked this morning (6 miles--woohoo!) and it was beautiful outside. In fact, it was beautiful all weekend. Abbey and I ran some errands this afternoon and I was so excited because we didn't need to wear our coats. I've worn a coat everyday since October, I think. We got home about an hour before I had to get the other kids from school, and it felt like the temperature had dropped about 30 degrees. It was F-R-E-E-Z-I-N-G. About the time we got home from school it started snowing. I think we're only going to get an inch or two. I hope so anyway. A bigger, stronger snowstorm is supposedly heading our way in a day or two. This one is supposedly going to bring "significant accumulation" to our area. We'll see. I got really tickled a couple of weeks ago when a friend in Arkansas blogged about how beserk everyone gets when the weatherman hints at snow. You'd think that living here where it snows a lot that people wouldn't freak out, but they actually do. The "panic-o-meter" is already inching to the right. We'll see. This is really not the week that I need a major snowstorm to hit. Do you just love Hobby Lobby? Abbey and I went there this afternoon and got some stuff to make Valentine gifts for the kids' teachers. I'll post a photo once we get them finished, but I'm hoping they turn out really cute. That store inspires creativity in me. I kept wishing I had more time to walk around and get ideas! So fun. Must go get dinner finished and start some homework. I hope your week is not as crazy as mine! Will has a birthday this weekend. He turns eleven. Eleven. I can't believe how quickly 11 years have passed. He has wanted a Wii forEVER! I really wanted to get one for all of the kids for Christmas, and we even found one to buy, but at the last minute decided to skip it. Will was sorta/kinda disappointed, so I told him to save his money and we'd try to find one for his birthday. He took me at my word and has been saving ever since. I was walking through Walmart a couple of weeks ago, and as I was walking past electronics, I thought I'd check and see if they had any available. They had received 3 that morning, and I snagged the last one. We gave it to Will after school today...and he was ecstatic! We've been playing all afternoon and evening and it IS SO COOL!!! And ridiculously FUN!!! And completely ADDICTIVE!!! I LOVE it!!! We ALL do actually. Happy Birthday, Bud! "Wii" love you! My friend, Carrie is hosting a recipe idea exchange on her blog. Earlier in the week she asked for recipe idea requests, which she posted today so that readers can respond. I requested some good crock-pot recipes. Anyone have any great ones they'd like to pass my way? My friend, Allison, made Crock-Pot Lasagna for us last week, and it was so yummy that it's on my menu plan for next week. 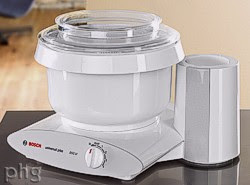 If you have a simple, easy, and delicious crock-pot recipe you'd like to share, please do! And check out Carrie's blog for some other great recipe requests and ideas! John bought me a new cell phone a couple of weeks ago. My other one was 5 years old, and had been dropped a few too many times and he figured it was time for a new one. I told him I didn't need bells and whistles...just the basic model, please. I came home to find my new phone on the kitchen counter, looked it over, made sure I could dial and answer, then walked away and forgot about it. When my kids came home from school later that afternoon my 5th grader (who loves all things electronic) spent some time playing with it. He asked me if I'd taken any pictures with it. What?!? It took a 5th grader to point the camera feature out. And my 5th grader helped me set my ring tone and showed me how to add names/numbers to my contact list, and how to text because I've never sent a text message. He also asked if he could play with my old one, and in 15 minutes, he knew more about that phone than I did in the five years I owned it. Who needs an instruction manual when you have an almost 11-year-old son? So apparently I'm not smarter than my 5th grader. Not even close. You guys had me in stitches trying to guess what I changed on my blog yesterday. Carrie was the first to correctly guess that I changed my url. I decided that $10/year for a custom domain was too great a deal to pass up! If it doesn't show up as lifeat7000feet.com in your browser window, don't worry, it should all get switched over in a few days. And even if you click on my old address for the rest of your days, it will automatically re-direct you (as long as I keep paying the $10/year). Poor Carrie doesn't have a Starbucks in her town (such a shame!) so I'll be sending her another prize instead. Thanks for playing along! And thanks to Kelly for making me aware that buying my own domain was even an option! *UPDATE* After 14 incorrect (but really fun) guesses, it occurred to me that maybe not everyone can see "the change". Clicking here should make all the difference. I'll let you keep guessing until someone discovers it! I want to test your observation skills, friends. I made a small, but exciting change on my blog this afternoon. If you think you know what it is, leave me a comment. If you're the first one to correctly guess what I've changed, I'll send you a small prize! Probably a Starbucks gift card. Okay...guess away! *And no, it's not my 2008 mileage. That does change, but this is much more exciting! I don’t know if you’re like me, but I’m task-oriented and find it hard to relax unless my work is done. I have a several questions hanging over my head that I still need to answer from this post, so here goes. And Julie, I skipped yours (for now) because your question requires it’s own post. Carrie asked me to introduce you to my siblings, wondered what my major was in college, and asked what I would do if I weren’t a stay at home mom. I am the oldest of three children in my family. I have a sister, M, who is fifteen months younger, and a brother, JP, who is about 4 years younger. They are both married and live in Arkansas. I’m being purposefully vague to respect their privacy! And about my college major. Well, I started out in Business Administration, thinking I might like marketing. I hated all my business classes, and my grades are reflective of that dislike. I really love history, so I gave that a shot too, but my dad who was footing the bill at the time convinced me that unless I wanted to teach, a degree in history was useless. I ended up majoring in Religious Education. Let me be clear that this is NOT a teaching degree. I am thankful that God calls some to teach, but I am definitely not one of them. It really is more of a church education/administrative degree. I chose Religious Ed because I thought it complemented John’s pastoral ministry well and it was something I was interested in at the time. I often joke that I should hang my framed diploma in the laundry room where I can view it daily and remind myself that I really am trained to do something besides laundry. What would I do if I weren’t a stay-home mom? Well, I’d cry a river of tears. If I ever do go back to work, which I hate to think about, but is probably likely in the next few years, I probably won’t do anything that would use my degree. And I have no idea what I might do. If I could do anything, I’d love to be a librarian. I love books and I love order, and the two just go hand in hand. I also think I’d like to be a meteorologist because I am fascinated by weather. I wish there was a way to do/be those things without having to return to school. Moving right along, Susan wants to know what I am passionate about. A couple of things come to mind here. I’m passionate about my family and home and living simply. 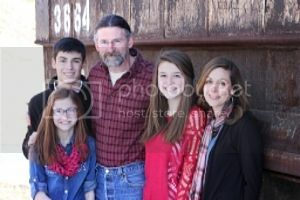 I’m passionate about recording the story of our lives (primarily through scrapbooking/journaling), and I’m passionate about my faith in Christ, and teaching my children to know and love Jesus. Jenn asks… Through your posts on your ornaments I know you like to travel. Where is your favorite place to visit? And if you could travel anywhere (money and time not a factor), where would it be? Easy. My favorite place to visit is Rocky Mountain National Park in Estes Park, Colorado. I love, love, love that place and never tire of visiting there. If I could travel anywhere, I would choose Italy. I doubt I could get enough of the history, the art, the architecture, and the food! It would be the trip of a lifetime! My friend, Renee, who is going to hike Pikes Peak with me this year, wants to know… What's your biggest pet peeve? What has been your most embarrassing moment? In what way is your life different from how you expected it to be when you graduated from college? My biggest pet peeve is waiting on people. I think if you tell someone you’ll be there at 4:15, then you need to be there at 4:15. Sure, there are reasons that prevent us from being on time, but I strive to be respectful of other people’s time, and I appreciate it when people return the favor. Another big peeve is stepping in something wet when I’m wearing socks. Really, Renee, I have many pet peeves, and when I experience something that bugs me, it usually gets bumped to the top of my “biggest pet peeve list”. I don’t know how to choose my most embarrassing moment because I have so many. There’s the time I asked a lady when her baby was due only to find out she wasn’t pregnant. Believe me, I really needed the earth to open and swallow me whole at that moment. Another time I was going somewhere with my friend’s youth group and we had a long bus ride. Unbeknownst to me, I sat on some chocolate candy that melted and got all over my jeans and looked like I sat in something much more disgusting. I didn’t have a change of clothes, so I had to walk around like that much of the day. I was sixteen and mortified. Truthfully, embarrassing stuff happens to me all the time. Just last week I called my friend while I was running an errand. I thought I was talking to her husband and that he was being obstinate when he kept telling me that “J” wasn’t there and that I had the wrong number. I finally said, “Okay, would you please cut it out and just let me talk to her already”. Turns out I really had the wrong number and I hung up really fast. I’m smart like that. Being able to retreat for several hours yesterday was very nice. I ended up going to the World Prayer Center at New Life Church and spending several hours in a comfy recliner looking out at the mountains, well, actually looking at the snow clouds hiding the mountains. Still, it was a restful and worshipful time, and I'm thankful that I could get away. I came home feeling refreshed and thankful that I pushed through some of the difficulty I had in getting out the door! But perhaps the biggest blessing of the day came last night at dinner. Many of you know that our family attends an Anglican church with ties to the country of Rwanda. I won't take up space here trying to explain our denomination, but if you're interested in learning more, click here. Anyway, our church has a sister church, in Kibali, Rwanda, and the Bishop who is over that parish, has been visiting Colorado this week. Our friends, S and A, hosted the Bishop and his wife for dinner last night and invited our family to join them. And what a blessing it was to sit around their table and share a meal and some fellowship this sweet couple. They both speak incredible English, and we spent much time talking about church structure, his job overseeing 327 churches in his diocese, and some of the new work that is going on in Kibali. Fascinating. But even more fascinating were the stories they told about surviving the 1994 genocide. Stories of being in their home for a month, with 26 others that they took in. Stories of how God supplied their needs for food and water for 32 people for a month! Stories of God's incredible and supernatural protection from the fully armed militants that surrounded their home. Stories of a Muslim coming to faith in Christ while in their home during that time. Stories of how God protected their children from seeing much of the violence. Stories of the generosity of friends during the post-genocide instability. Amazing and beautiful stories that I did not want to end. I told the Bishop that it seems so hard for me to believe that this all really happened. I live so far away from Rwanda, and when I think about something so horrific, it just really seems unreal to me. He told us that even though they lived through it, it seems unreal to them too. Our friend, S, was one that went to Rwanda this summer with a group from our church, and he told us that in Africa, they love to give gifts. So...we gifted them with some Colorado souvenirs, and some chocolate, which they seemed to love. Then we gathered all the children around them and took a photo. "A" has a photo printer, and she quickly made a print for them. I got so tickled at their reaction. They were wide-eyed with amazement at how she was able to instantly give them the photo. So, we took another one with the adults, and they hovered over the printer and watched the photo print out. Mesmerized I tell you...they were mesmerized. It was so cute to watch them. The evening passed much too quickly for me and I was so sad when the time came for us to leave. The Bishop prayed over all of us before we left, and as we were saying our good-byes, I gave them both a hug and the Bishop said to me, "Meredith, I will see you when I see you again...in Rwanda". I hope with all my heart that I can visit there someday. It would be a dream come true. Can I just say that I am very tired of the wind. It has been howling here for days. And it's terribly annoying at night. I guess I notice it more at night because the house is quiet, but sustained wind speeds of 40mph, with gusts up to 66mph, make it hard for me to sleep. I don't normally have a hard time sleeping. There are rare exceptions, such as when John is out of town (like he was last week), but last fall I discovered Tylenol PM, and now I don't even really mind it when he tells me that he has to be gone for a few days. BUT the wind. Oh my goodness, this wind is killin' me. When it gusts, it makes an annoying whistling sound and rattles our screens and shutters so hard I think they're going to blow off, and makes it almost impossible for me to sleep. I'm so ready for a good night's sleep, and if the wind is howling tonight, I think I'm going to have to take my last 2 gelcaps...and find a pair of earplugs. And okay, I'll stop whining now. As you can imagine, wind like that makes it feel colder outside than it really is. Yesterday, it was sunny and warmed up to almost 30 degrees, but the wind chill made it feel more like 10. When I went to pick Abbey up from kindergarten, I pulled my toboggan on, partly because it was cold, but mainly because I hadn't showered yet and my hat covers a multitude of hair woes. I was driving to get her and kept trying to pull my hat down over my ears, but it kept creeping back up leaving my ears exposed. I could not figure out how my well-loved toboggan shrank overnight, and finally positioned my sunglasses on the outside of my hat to keep it in place. A few minutes later when I was opening the van door for Abbey, I caught a glance of my reflection in the window. I looked like the cat in the hat with a foot-long toboggan on my head. I pulled it off to find my gloves, a pair of the kids' gloves, and one of Abbey's hats stuffed inside it. Who knew? No wonder I couldn't pull it over my ears! It was quite comical if I do say so myself, and I had a good laugh. I learned a long time ago that being able to laugh at yourself is a very good thing. I was supposed to hike this morning with my friends, but we all decided to skip today because of the crazy wind. We hiked on Monday and nearly blew away, and this was a more wide-open and exposed trail, so I'm hoping that we can go on Monday. There's a chance of snow, so we'll see. I hiked through some pretty deep snow last week and I'd liken it to running on the beach. It took effort to trudge through that stuff! See...I told you this was long and rambling. Actually, I probably would have had to opt out of a hike anyway, because Sarah is home with me today. She coughed throughout the night and she's working on a cold and looks kinda run down to me. I let her stay home (she wanted to) so she could rest. Truthfully, I like it when someone is home with me, so I'm a sucker when my kids tell me they don't feel well. "Sure sweetie, why don't you stay home with mom today?" I'm hoping we can watch Little Women together later! On the way home from Denver the other day, Abbey and I stopped at the Gap outlet. I think I've mentioned a time or two that I don't like to shop, but I always, always find fabulous stuff at that store for Will and he was desperately in need of some long-sleeved tees. I ran in quickly and found what I needed right off the bat. I found 4 shirts for him (4.99 each-score!) and since Abbey was with me, she wanted to look at the girl stuff. They had Valentine's t-shirts for 4.99 too, so I let her pick one out, and I picked one for Sarah. Sarah is quite the opposite of her sister and doesn't like anything pink or purple. So, I chose green. They both wore their shirts to school yesterday, and Sarah came into the kitchen before we left and told me (sheepishly) that she wished her shirt was like Abbey's. I reminded her that she didn't like pink and she said, "Well, Abbey's isn't pink, mom, it's actually blush". I learn something new every day. She finally decided she liked the green. Here's a photo...in green and pink respectively. Tomorrow I am going to get away for my personal spiritual retreat. I still have no idea where I'm going to go. I've been trying to pray about it, and I have some ideas, but nothing is firm yet. For some reason this has not been an easy thing to plan, and I'm tempted to just give up on making it work this weekend, but I really believe that you have to "fight" for the things that bring you life. John and I talked about it before he left for work and he told me he woke up feeling like I really should go, so I'm going. Tomorrow. Somewhere. And I'm praying that it will be all that I need it to be and more. And now, I must go and tend to the girl. And start some laundry. And shower. And make some phone calls. And you get the picture. One more thing. I haven't forgotten your questions I still need to answer! I'm working on it...promise!